Luke Hinsley celebrates his goal on his return to the Frickley Athletic side with striker partner Jacob Hazel. Frickley Athletic’s swoop to bring one of their favourite sons of recent times back to Westfield Lane paid instant dividends when Luke Hinsley made a goal scoring return last Saturday. 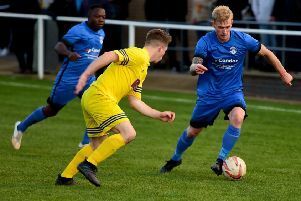 Hinsley, who made more than 200 appearances in a Blues shirt in his previous spell, rejoined Frickley from Evo-Stik Premier Division side Matlock Town in time to play in the big derby at Pontefract Collieries. And it proved a successful return for the 28-year-old with a man of the match display as well as scoring the Blues’ first goal in their 2-2 draw against opponents flying high in second place in the table. The goal almost helped 12th-placed Frickley to a great victory only for an injury-time equaliser to leave the honours even. After the game Hinsley said he was pleased to be back at the club and thought the side had recovered from a poor start in the game to be well worthy of their draw. He said: “It was disappointing losing the last minute goal. “The first half I thought we were nowhere near, but we came out firing in the second half. “In the changing room all the lads are gutted at that late goal. It’s just come of Jammer’s hand and fell to one of their lads – it was just unlucky. Hinsley had been with Matlock for six months after joining part-way through this season from North Ferriby, scoring a hat-trick on his debut. He went on to score nine goals in 22 appearances, while he now has 40 in his career for Frickley after playing in a variety of positions in his previous spell. Up front is where he went straight into the team last weekend and there were promising early signs of forging a successful partnership with Jacob Hazel. On his move Matlock boss Dave Frecklington explained: “With the transfer deadline on Thursday the last thing I wanted to do was keep people after the deadline and if things don’t work out, they’ve no club to go to. “I spoke with Luke after Frickley put an offer in, I couldn’t guarantee Luke games and looking at next year it was probably best for Luke to move on. Frickley have also added two more players to their squad with 20-year-old defender Charlie Jemson – son of former Football League star Nigel – joining on loan from Tamworth. He is a product of the Nottingham Forest academy and will be with the Blues until the end of the season. Also joining until the end of the campaign is goalkeeper Sam Wilson, who has arrived from Mansfield Town. Both Jemson and Wilson made their debut at Pontefract. Frickley now play another away Yorkshire derby at Sheffield FC this Saturday when they will be looking to make amends for a 3-2 defeat in the home match against them back in October.